Note: The most current release notes are at the top of this document. The oldest at the bottom, including 2.10 release in late December 2016 noting new features most relevant to 2017 users. This is a running release note guide since the 2.10 release and includes desktop (web), iOS, and Android. If you are experiencing an issue with the product, please Contact Support from within the Web or Mobile app to get help or let us know about the issue so we can fix it! This release adds support for subscription package migration and displaying of updated Privacy Policies. Added Subject Property to the top row of Comparable and Neighbor grids. Improved memory usage of the app. PropertyProfile: (1) Added Zip Code to the address overlaying the map. (2) Added the subject property to the top of the Comparables and Neighbors tables. (3) Improved the dialogs used to add phone numbers and social media links to Contacts. Maps: Improved the ability to click on maps throughout the UI to see property cards. Export/Mail Merge changes: (1) Added Owner2 to Mail Merge export. (2) Removed TransferDocNumber from Transfer Search export. Removed rental options from legacy search options. Improved the user experience in Quick Search > Explore when the browser has not received permission from the user to access their location. Improved how the client handles logging in with different users with different subscription packages and defaulting to a feature not available to the second user. Added appropriate checking and messaging when a non-admin team member attempts to delete a team saved search. Fixed the formatting of My Value/My Rent to be always displayed consistently after editing. Changed how the property card is displayed in Explore. This will prevent the card from popping up behind the legend. You can now submit a My Value/My Rent using the Enter key when editing. Fixed a cosmetic issue with displaying the Checked On box in Property Profile when using Windows. The Contacts view of Property Profile will no longer scroll to the top when editing a second/third/etc contact. 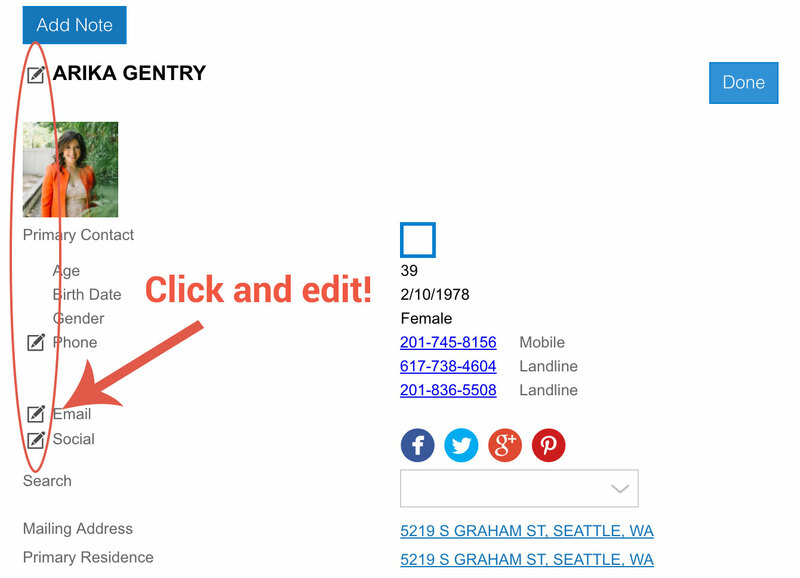 Print reports will now use the contacts Owner name rather than the legacy Assessed Owner name. Note that Export still uses the Assessed Owner name. Resolved several instances of Reports not printing using the user displayed sort order. The property displayed to the right of the map in legacy search results will now reset when a search is a re-run. Resolved issue where the wrong search options can be displayed after opening Search Options from Saved Properties. Fixed issue where having "<SELECT>" in a saved search name broke the display of saved searches. The Export dialog will no longer show invalid negative balances of available free exports when all free exports have already been used. Added an Upgrade prompt to the error in Make a List for using criteria not supported by user's current subscription package. Improved how contact phone numbers are handled. Previously if a user had added phone numbers to a contact then upgraded to a package that provides phone numbers, they would only see the one they manually added. Now a user who upgrades to gain demographic data will receive our list of phone numbers for a contact as well as those they added manually. Comparables will no longer display properties which do not have enough data to calculate a comparable value. Fixed an issue where long list names would overlap the Settings icon on List cards preventing the user from opening settings. Opening a property from list Card and Map views now properly inserts that property in the Next/Prev order in Property Profile. Fixed chips in Make-a-List to show radius values to the same precision as on the map (two decimal places). When clicking on a chip for multi-value criteria, those criteria will now be displayed in the selection area. Fixed Prev/Next in Property Profile from Trustee Sale Schedule to honor the user's sort choice. Resolved inconsistencies between results and reports/exports when doing an Owner Quick Search including a middle initial. Resolved an issue where adding a List to a property in Property Profile, then clicking Next/Prev to see another property would not show that list as available to add to the next viewed property. Changed the date format for Transactions from mm/dd/yyyy to mm/dd/yy . This is to resolve display issues when wrapping text on mobile apps, but also alters the display in the web app. Resolved issue where a user restarting a subscription would be stuck in Settings > Billing after resubscribing. Restored the listing price change indicator in Property Profile. Fixed an issue where the subject property could display as a comparable. Resolved the issue where the Purchase button was greyed out for users wanting to restart their subscription using the same package. Removed invalid report types from Comparables. Added wrapping to Associated Properties when viewing documents from Property Profile > Transactions. Resolved issue where not all Mailing Type reports were given as options. Resolved issue where only List View reports were available from Lists and Quick Search. Make a List > Owner > Demographics > Birth Month is not working. Sometimes a user who logs in with an inactive account is greeted with a blank page, rather than the "restart subscription" prompt. When creating polygons in Make-a-List and Search Options, sometimes a property card will pop-up when trying to add polygon endpoints, preventing the closing of the polygon. Printing reports: Sometimes the map of the property location does not display in the PDF report generator. Sometimes the Foreclosure Stage is not printing in the report correctly. This release updates the Property Profile in line with the 3.0 web app. This release is compatible with the latest 8.0 Android release. The app occasionally crashes after viewing an external link such as Listings on Zillow and getting directions from Google Maps. Opening a LinkedIn profile from a Contact when you have the LinkedIn app installed can leave the user stuck in LinkedIn and require the user to kill our app to get out. This release resolves some customer issues, refines the UI and improves usability. Made the My Lists selection in Property Profile to be more like the web client. This should make it more intuitive for removing lists from a property. Improved the Find (binoculars button) in legacy search results to better match expected data. Fixed issue where the name suffix for contacts was not always displayed. Fixed the Prev/Next buttons not working in Property Profile if opened from map view. Layers can now be turned off in Explore by tapping on the currently active one. Fixed issue where the Purchase parcel map button was not changing to View after purchasing a parcel map. Improved the user flow for backing out of a deep linked property. Fixed the date format in edited Transactions documents. Resolved issue where some columns in legacy search results would not populate after adding them without first running a different search. This includes all the My Data columns. Resolved issue where Status Level was being displayed by index numbers rather than the string value in legacy search results. If you have My Data columns and you make a change to any of those values in a property profile, then return to search results, the changes are not updated in the search results. Resolved issue where the parcel layer was not always displayed on the map in Property Profiles. This usually happened after using Explore. Resolved issue where a trial user trying to subscribe would see the Subscribe button disabled when their current package is selected. Note that if the user goes through the Upgrade flow (such as being prompted that a feature is not available to them), this will still be the case. Resolved issue where the user could not select a date for TSS if the current TSS search had zero results. Save Property screen was updated to match the current color scheme. After purchasing a parcel map, the link to open it is not available on the Property Profile. The user needs to reload the profile to view the parcel map (either return to the search results of tap next then prev to reload). Note that if they tap the Purchase link and try to purchase again, they will see a generic failure message rather than being told they've already purchased the map. Transaction History shows "Warranty Deed" as "Transfer"
When flipping through properties from Lists, the prev/next navigation will now traverse from the top to the bottom/bottom to the top of the list when flipping past the end. Resolved issue where Shared Criteria would break if using multiple values for criteria such as City/County/Zip or multiple ranges for things such as Address Number or Value. Resolved issue where column orders were not being persisted when you switched from one search type to another in legacy searches. Resolved issue with Upgrade button being greyed out. It will now default to your current package and be greyed out. When selecting a new package, it will be usable. Added an error message if someone attempted to open a Shared Criteria link that was invalid. MAL chips will now show the radius in the measurements you selected. Currently only ft/miles are available. Lists made in the past couple weeks will still display meters and will not be updated. Added the Next/Prev navigation to Property Profile when opened from List Card and Map views. When upgrading a subscription within the app, the user will not immediately see the new features. In Make a List, they will be prompted their package does not support the criteria, then their current chosen criteria will be cleared. They can then create a new list with the previously restricted criteria. In Property Profile, the user will need to refresh their client (or log out/in) before the profile will show the previously restricted values. When a user has added phone numbers to a Contact upgrades to a package that lets them see phone numbers, any Contact they had previously added a phone number to will not show any phone numbers from our data. If you have a list with a really long name that does not wrap, it blocks you from being able to click the Settings icon from My Lists. This makes it impossible for the user to Delete/Copy/Share this list. Prev/Next is an unexpected order when opening a property from List Card or Map view. It treats the property as if you opened the first in the list. Clicking Next then Prev will not restore you to the originally opened property. When saving properties from legacy search list view, the type icons are not updated automatically and the Saved filter count does not update. If you re-run the search, they both update. Clicking on chips in MAL that represent multiple values such as City or Zip do not populate the add criteria section with the existing values. It does work if you use the left hand nav to get that criteria. This release introduces Shared Criteria and changes our subscription packages and prices. We will now restrict some data within Property Profile based on package levels. Settings > List View Columns was removed. Adding/removing columns in legacy search list view now works like it does for List list view. Previous settings should persist to the new method. Resolved issue where some search options like State/Country are cleared from Search Options after viewing a property and returning to Search Options. Restored the Prev/Next navigation to Property Profile when opening from List Card and Map views. The 3.05 hotfix addresses several customer issues since the 3.0 release and has some UI tweaks. No new features are included. Restored the various report options when sending via e-mail from List View Results. Previously only offered List View reports. Separated the print report and e-mail report buttons from List view, Search Results and Explore. The dialog to edit Social links from Property Profile will not become scrollable if there are more existing links than fit on the screen. Windows shorter than about 750 pixels will still not work correctly in all cases. Users can now edit Social links for users that currently have no social links. List view and Search Results will better synch with changes made to properties. For instance, if you view a property from a list and remove it from the list, returning to List view will no longer show that property. However, this behavior requires about a 5-second delay after removing the list and returning to List view. If you return in less than 5 seconds, it will still display until you make a similar change to another property. If the list is dynamic, there is also a chance that it could be re-inserted to that list. For legacy Search Results, no delay is necessary. The property cards displayed from Comparables no longer change the mouse cursor to give the illusion you can click on them. Improved the experience when trying to login to a team that no longer exists. The user will be prompted the first time that their default team login is invalid. When they log in the second time, they will be reset to themselves. Previously they had to delete their cookies to reset their preference. Resolved issue where clearing the offer amount in Investment Analysis would take two tried. Note that this now means the value gets set to $0 when you delete it. The associated calculations also are now based off $0. To reset all values, the user should use the "Reset" button. 6943: Associated Property addresses in View/Edit document sometimes do not wrap and are shown as a single, merged string. The July 30 PropertyRadar 3.0 was a BIG release. As is typical with those really big releases, some things get broken in the process. The 3.0.2 "Hotfix" release addresses most of those issues. The app now remembers the vertical scroll position in Property Profile while flipping through properties. For instance, if you're looking at Foreclosures when you go to the next property, it will consistently display the Foreclosures section rather than jump up to Location. Resolved issues with Foreclosure notices incorrectly displaying in Property Profile when opened from Foreclosure and TSS searches. The Foreclosures Section in Property Profile will now always show, even if there is no Foreclosure Activity. Restored Multi-Polygon in Make a List maps. Note that Make a List does not support overlapping and intersecting polygons. If you edit the Owner Name in Contacts, that new Owner Name will be used for Mailing Labels, Mail Merge, and Direct Mail. Exports will still use the original public record owner name known as "Assessed Owner". Note that the label used in Exports is still Owner, Owner First, and Owner Last. Added Garage, Air Conditioning, and Heating to Property Profile. List names are now limited to 50 characters. This prevents an issue where list names greater than 50 characters do not function as dynamic lists in the web client. Note: There will be a future fix for existing lists with longer than 50 characters. Those will still not work properly with this fix. Fixed the ability to delete a List when those List names contain #, ? or / characters. Fixed an issue whereby if you chose to Edit instead of Add a note to a Property with no notes, it would not save. Added "State" as a column option for Lists (and Quick Search) list view. Fixed issue with uploading photos to Property Profile using IE11. Fixed an issue where both the previous and current owners would show in the Contacts section of Property Profiles. Removed Owner Phone Yes|No from legacy search options. Also removed Owner Phone from legacy search List View columns settings. Fixed links to open Property Profile from Alerts displayed from Saved Search > Alerts. When using Find in Explore to change locations, the location beacon is now disabled. Made the control to add Lists in Property Profile and Save easier to click in. Removed the confirmation prompt when Saving Notes. Clicking will save without asking Yes/No. Owner Quick Search will now be consistent if you type "Bob Smith" or "Smith, Bob." Driving links in Property Profile will now use Lat/Long if available, and the address is Unknown. Deleting Contact notes no longer inserts a date in the Notes field. Fixed the appearance of the Heat Map/Boundaries dialog for Comparables and Neighbors maps. Note that the dialog is slightly too large for the space. When editing a Document from Transactions, uploading a document no longer destroys your unsaved edits. PropertyRadar 3.0, our most significant release since 2014, is now live. We’re excited, and we think you will be too. PropertyRadar 3.0 introduces lots of new data and many new features to help you grow your business. Highlights, with full details below. More Contact Data! 40+ million phone numbers, including mobile numbers, social media profiles, and lots of demographic data about property owners and their spouses. Getting to know, and contacting your prospects has never been easier. Property Profiles Now Use Tabbed Navigation. Better on-screen organization allows you to get to the info you need faster and easier. No more scrolling through information you don’t care about, now you can quickly click through the Property Profile tabs to jump to the info you need. Contacts Tab with Editable Contacts. The Contacts tab in Property Profile provides all we know about the owners of the property, including spouses. Now you can edit and update their name, phone numbers, email addresses, and social contact fields. Change William to Bill, Margaret to Peggy. Delete an old phone number, or add a new email address. Your contact info – Your changes! Other Properties Owned by a Property Owner. Within the Contacts tab, the Other Properties field is a new, work-in-progress effort, to figure out all the other properties a contact owns. Far from perfect, yet good enough now to save you a ton of time and research. Maps and Map Tools are Consistent and Enhanced Across the Platform. Everyone loves Explore, so we made all the maps look and operate the same throughout the App. They have everyone’s favorite thing: heatmap layers! Almost 80% of you asked for phone numbers. You got it. We’re adding over 40 million phone numbers for property owners and their spouses. And, until September 30th, this feature comes at no additional cost. On October 1st, those phone numbers will be available to you for a small additional charge. But when you see how the numbers are helping you grow your business, it’ll be a no brainer to keep ‘em coming. Don’t worry – the cost won’t be much. And, now you won’t have to buy phone numbers from other list providers. With PropertyRadar 3.0, you can have unlimited, always up-to-date contact information with your subscription. We’ve been working on this concept for over two years, incorporating as much feedback from customer surveys and usability tests. Recently, over 80% of customers indicated a preference for tabbed organization over long-scrolls. Our new Property Profile design features tabbed navigation, and it’s organized so that it’s faster and easier to get to the info you need, without having to scroll through info you don’t. Between all the new data we added, and what we intend to include in the future, there was simply no way a single, long-scroll Property Profile would be efficient or easy. It looks awesome, and it becomes super intuitive to use in minutes. A customer we previewed it to the other day called it the “Facebook for Properties”. We like it. The top header of the Property Profile now shows where the property is on a map, and we load up a street view of the property if it exists. Street view pulls the whole, new Property Profile together. 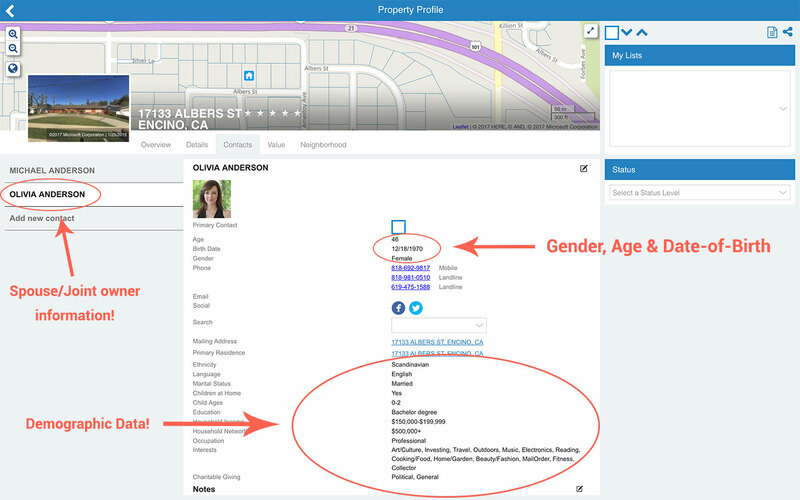 The main Property Profile navigations tabs are: Overview, Details, Contacts, Value, and Neighborhood. The Overview is just that – a summary of the Property, Contacts, Value, and your Photos. On the right, you can add or remove the property from your Lists, and select your Status. Next there’s…a big blank space …cool, huh? Actually, something new and exciting goes there that didn’t make it into this release, but will arrive with the next. You’re going to like it…stay tuned! Under the Details tab, you can find Location, Site, Structure, Property Taxes, Transactions, Foreclosures, Listings, and your Photos, Notes, and Files. You can quickly jump to heading information, by clicking the heading on the left. Under the Contacts tab is the owner information for that property. And you’re going to love this…you can edit, add, and update that owner’s contact data. Gwendolyn prefers to be called Wendy, and she recently changed her email address…now you can edit the Contacts info as needed. The Value tab has Summary, Purchase, Market Value, Market Rent data, as well as the Comparables and Investment Analysis tools. Finally, the Neighborhood tab has improved visualizations, and some added information at the county and state levels. The Neighborhood tab is organized into Demographics, Housing, Housing Risk, Neighbors, and Environment headings. 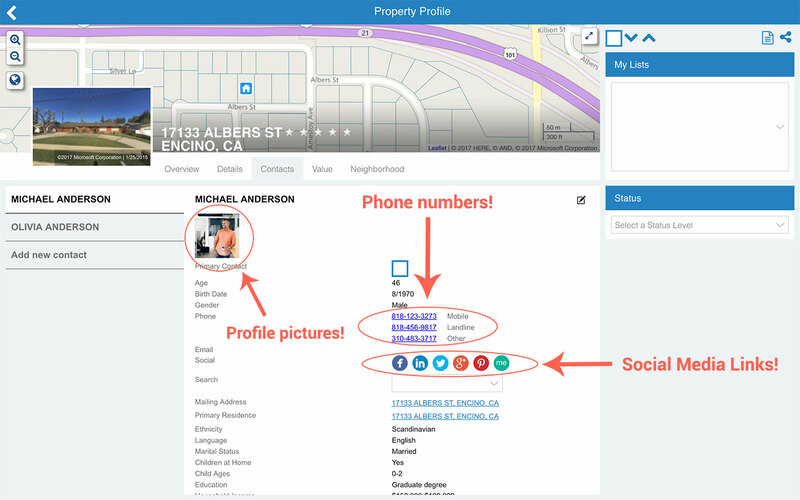 Note: this new Property Profile will roll out to the mobile apps soon – which means all this data and these features will be available to you in your hand. It’ll be easy to just tap to a tab on your smartphone. Of all the features introduced in the new Property Profile, the Contacts tab is certain to get the most attention. Getting to know your prospects, and getting in touch with them is where your research turns into action, and action turns into growing your business. Under the Contacts tab, our aim is to provide the profile pictures, phone numbers, social media links, and mailing addresses for the property owner(s). Will it be spot on all the time? No, but it’s as good as any other list provider, and even better in context. And know that every day, we’re working hard to make our matching algorithms robust. We did it with foreclosure data, now it’s only a matter of time before we change the game with owner contact data. We’ve made several fields in the Contact tab editable. Change a formal name to a nickname. Delete a bad phone number, or add a new email address. And if you add a new email address, we’ll immediately search and append social profiles associated with that email address, if they exist, to the Contact tab. By updating the owner’s name, you can personalize your direct mail campaign. Using the name the owner prefers, you can make huge strides in that connection. Within the Contacts tab, we’re adding a small, heading called Other Properties. We’re continually updating our algorithms, to figure out what other properties an owner may own. It’s not perfect, and we’ve got many more months of tuning algorithms and combing through trusts to match everything up. But it’s super cool as it is now, and is a huge research time saver, so we decided to include the initial design in this release. This feature won’t reflect properties owned outside the five states we cover. If Carlos owns a condo in Colorado, that will not be shown until we expand to nationwide coverage. And due to a mind-boggling array of public data recording inconsistencies, and the smokescreens of trusts, the data may not always be accurate. Even so, your research time can be reduced significantly. Oh, and by having all the Other Properties there, it’s an incredible insight into the net worth of the owner. And with phone numbers and all this demographic data, nobody’s going to bother their title rep for an old-school property profile again. Finally, we’ve made some significant updates to our maps and map tools. Everywhere we have maps, the interface and the tools are now consistent. Since everyone loves the heatmaps in Explore, we added the Layers heatmaps and Boundaries overlays; as well as consistent Aerial View, Location, and Measure options in every map interface. But the big news with maps, is that you can now select any property on the map, even if it isn’t in your results, and see an overview of that property. And in many instances, even view its Property Profile. Some of you may get freaked out that we have so much data on everyone. Maybe even on you. We know, we get it. But here’s the deal: it’s 2017. All of the big companies already have this data and are using it all day, every day. If this freaks you out, then your option is to get rid of your cell phone and never use Google, Facebook, or Amazon again. Our mission is to find a way to make the data and tools that previously only big businesses could afford, and level the playing field; making that data and those tools available to small businesses, at an affordable cost. Big businesses are investing millions of dollars into data and in acquiring the most sophisticated tools. Just know that anything you see in PropertyRadar now, has been used by Big Business for years. We like to think of ourselves as the “Big Data Robin Hood” for small, local businesses. Except for the tights, of course. We’re obtaining the best data and data-marketing strategies used by Big Business, and finding ways to make it available to you. We’re obsessed with tilting the advantage away from Big Business, and back into your reach…at fraction of the cost. Is Big Business happy we’re doing this? No, but nothing’s stopping them, so who says we can’t provide the data to you? As always, a major release like this will introduce some bugs that we’ll need to fix. We do our best to test, but with a ‘couple million lines of code’ and billions of data records, we can’t always catch everything. Changes to alerts: When a new Listing record is inserted, it becomes a "Status Change" rather than a "New Match" unless something about this new Listing makes the Property now match their search. This affects legacy Searches only, not Lists: new Listings that cause a Property to be added to a List will still show as a new match. Changes in setting appropriate email headers for better processing when User's alerts-related email address isn't correct. Resolved a bug where the link to White Pages was not working as intended. 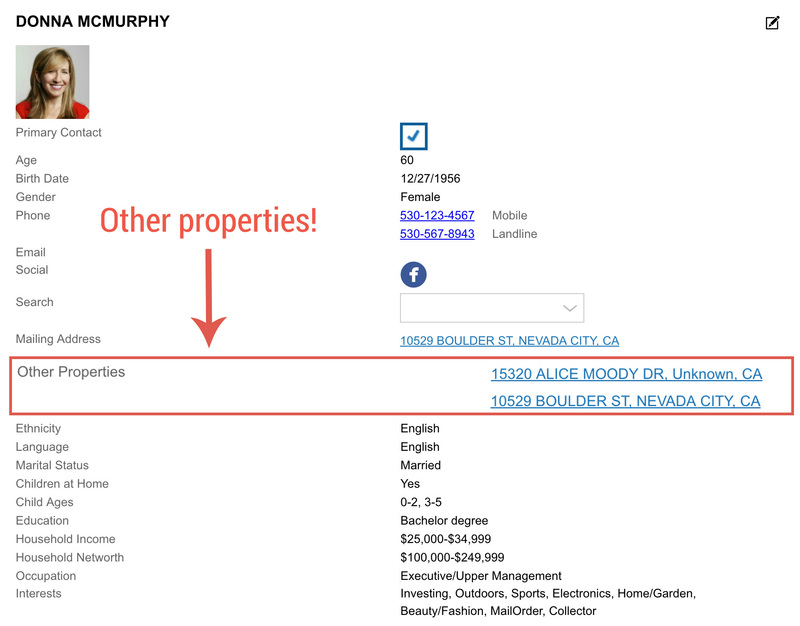 The White Pages link is in the Owner Search drop-down menu on Property Profiles in the Owner Section. Resolved a situation where the app would crash when using the Assessed Value and Mortgage Debt layers in Explore. Get the latest app for iOS here. This is a bugfix release to resolve some customer reported issues. Updated e-mail address validation to support modern top level domains with more than three letters such as ".university"
Fixed opening Property Profile clicking on a Cards in Card and Map list views when using IE11 and Edge browsers. Android: Fixes the Property Type displayed on Cards for Lists/Quick Find. This broke with the PR 2.11.1 hotfix. The Property Type will now be visible again. Changed display of Property Advanced type in Cards to no longer show the internal "XXXX -" code. Will now only show strings such as "Single Family Residential." Fixed service errors when users entered "currency" values in Search Options using decimal values. Restored the radius size box to the location selection screen. Note that the measure tool and the shape tools (radius, rectangle, polygon) can no longer be used at the same time. Toggling one turns the other off. Improved handling of entering hundreds of APNs to Search Options. If the user enters too many, the client will tell them to use fewer. The limit is somewhere above 300 (it varies). Often, it's the little things that count. The 2.11 release for iOS and Android mobile apps are full of lots of new "little things" that we think will make your use of PropertyRadar on a mobile phone an awesome experience. About a year ago we started a relentless effort to clean up our user interfaces and make them more consistent across Web, iOS, and Android. The idea being that if you learn how to use a feature on the Web app, finding and using that feature on the mobile app should be as similar as possible. With 2.11, we're excited to be done with that moving on to bigger things! We've made it easy to do a Quick Search by adding a handy button (magnifying glass) in the upper-right corner throughout most of the app. This is one of our favorite features, and it's especially fun to look up people. We created a new tab bar in Property Profile. This contains the Prev, Next, +Photo, +Note and Share controls. Yay! No more scrolling to the bottom of a PropertyProfile to add Photos and Notes. It's fast and easy now. Filter - This used to be search "Options," and we moved it from the upper right. Find - Allows for finding items within your search results, without having to run another search. List View / Map View - these tabs were combined. Just click to toggle the display between the two. Layers - 13 overlays to better visualize your market or the street you're driving down. Legend - quickly toggle on/off the legend to understand what all those colors mean. Find - use this to quickly navigate from where you are at in Explore to a new location. From San Diego to Seattle in 3 seconds flat. Share - share the current map view on your screen with a colleague. We generate a PDF of that view that you can send by email or other apps your phone offers. Also in Explore, you can now toggle between aerial and map views using the globe button on the map, and we've improved the center on location button. Now the first click will center on your current location, and the second click will center you and point the map in the direction your phone is facing. Super cool, so be sure to play with it until you get the hang of it. It's just like they work in Apple and Google maps. We also got under the hood and did some serious tuning of the mapping engine on Android, especially when you're in motion and using the mobile phone's GPS. When you're out Exploring in your car, the map will be faster and more directionally accurate. There are some more details on bug fixes in our official release notes located here. If you haven't already done so, be sure to go over to the iTunes App Store or Google Play Store and update to 2.11! 5617: Improved display of star icons in Property Details to fix the issue with the star bottoms being clipped. 5697: App properly handles messaging users who log in with canceled accounts. 5729: Quick Search Explore now opens as a view of Quick Search and not at Explore. 5681: Aerial view on maps will not zoom in further than what map tiles are available. 5683: Fixed an issue where a deep email link was not opening the iOS app. 5728: Added spacing between "Total Loan Bal" and the value in Grid view. 5730: Fixed the Sort by dialog opening behind the search box. You can now sort results that have been filtered by Find. 5733: Improved the experience when switching teams. 5740: Fixed issue with Sq Ft and Lot Sq Ft cutting off values at the thousands comma. This is a minor release, mostly fine-tuning features introduced in 2.10 (see below). Some UX tweaks and a lot of bug fixes. Changed Quick Search to use List Views for results. Quick Search Person now allows either <first> <last> or <last>, <first>. It also now searches all owner fields. Quick Search is now accessible from all main feature pages via the magnifying icon in the upper right corner. Street and Aerial have been removed from the Layers. They are now accessed from the widget on the map. The legend can now be turned on/off. Updated the icons to be consistent across the web and mobile apps. Resolved issue where search Options > Location > County was not being updated if you changed your default state through settings. You can now create Reconveyances in Transaction History with a "Parent Doc." The criteria chip bar is now limited to three rows and is scrollable in Make a List. This resolves an issue where a user on a tablet would be unable to add criteria if they had a lot already selected. The client now prevents adding lists named with only white space characters. The service does not allow it, and the client was ignoring the error. Resolved issue with Make a List criteria suggestions losing context when switching fields. This was resulting in things like counties for a different state being suggested. Updated version in the menu. This hotfix resolves some known customer issues and other clean up work. Please note we did make one significant change – users may no longer create multiple teams nor create a new one if they are an admin of a team. They can still belong to as many as they get invited to. 6659: Removed the ability for a user to create more than one team. If they are the admin of a team, they will not be able to create another. They can belong to multiple or be assigned as admin to multiple teams. 5922: Fixed issue allowing a user to create unclosed polygons in search options. The was causing backend errors. 6668: List View reports from list Grid view do not include data for several fields if properties were selected. 6667: Reports allow for 15 columns, but only 14 are visible. The 14th is truncated. Reports are ignoring user defined column widths. 5741: When removing a list from a property, the profile is not refreshed and still shows that list. It is successfully removed. Navigating away and back to that property profile will refresh the display. The 2.10 release introduces List Views. It also removed the Copy To feature for saving items to other teams. 6623: Fixed the error page when trying to generate a routing report of more than 23 properties. 6630: Created a new Intercom event, "list viewed", for when a user opens a list to view. 6648: If you try to quickly sort multiple columns from List grid view for lists over 100 properties, the client can hang and require a forced refresh. This only appears to happen if quickly sorting multiple columns. If you wait several seconds between, there is no problem. These are the issues fixed in the 2.10.1 hotfix for the PR web client. 6596: Updated text warning you of changing your active team to be more generic. Was centric to the old dashboard UI. "Copy to" removed from the client for saving Notes, Photos and Files. Users are no longer able to copy any saved data to a team when adding it to a property. Owner quick search now treats <last>, <first> the same as <first> <last> as well as includes both the owner and owner2 fields. Both names will use synonyms, so if a user is searching for a last name of "william" it will also return names such as "bill"
6620: Lists loaded when creating a list do not display all results and show a count of "Loading...". Switching views or refreshing the browser can resolve this. The larger the list, the longer it takes for a refresh to succeed. 6627: You cannot use the Prev/Next button in property details from properties opened from List View. This still works for properties opened from searches. 6626: The client occasionally reports "the Criteria service failed" when adding criteria to a new list and sends multiple duplicate requests to the server. We are still investigating how this happens.